There aren’t a lot of places in the world where you can hear the topics of Andy Warhol, pirates, and second-harmonic generation microscopy being broached in the same conversation. On Friday at Wabash, there was one such place: Detchon Center’s International Hall, during the 19th annual Celebration of Student Research, Scholarship, and Creative Work. This year 87 students presented 39 talks and 28 posters. Since 2001, the Wabash College community has gathered on the last Friday afternoon of January to share in the work of Wabash students at the Celebration. 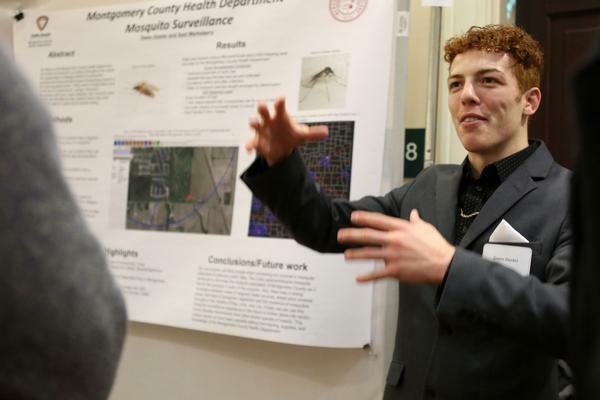 The participating students spend months completing their scholarly work and are then tasked—under the sponsorship of a faculty member—with condensing the information, writing an abstract, and presenting the work in front of their peers. "Our students' focused dedication, work ethic, and infectious curiosity were on display in top form today," said Lon Porter, professor of chemistry and member of the Ides, Celebration, and Undergraduate Research Committee. "They should be proud of themselves because they have made the entire Wabash community proud. 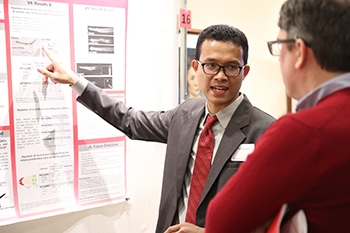 The 19th annual Celebration of Student Research, Scholarship, and Creative Work was an inspiring display of what Wabash is all about." Every year, afternoon classes are canceled by faculty vote to encourage student’s attendance, but they are not the only ones learning from the oral presentations and poster exhibits; while student rhetoricians, chemists, and creative writers stand shoulder to shoulder explaining their work, faculty, staff, coaches, and members of the Board of Trustees can be found shoulder to shoulder listening and asking questions. Prior to this year’s event, the Celebration Committee announced the winners of two awards associated with the Wabash tradition: The Celebration Research, Scholarship, and Creativity Award, and the Robert Wedgeworth Research, Scholarship, and Creativity Awards. The Celebration Research, Scholarship and Creativity Awards are prizes awarded to the students who most effectively articulated their gains in professional development and personal growth as a result of their research, scholarship, or creative work. This year’s winners are Miguel Aguirre Morales ’19, Nicholas Budler ‘19, and Walker Hedgepath ‘19. The Robert Wedgeworth Research, Scholarship and Creativity Awards are prizes that recognize a student’s effective use of library resources in the preparation of Celebration work. This year’s winners are Wade Haesemeyer ’22, Walker Hedgepath ’19, and Corey Leuters ’19.